Investing taxpayer funds in sports ventures can leave towns and cities on the losing end. Look at Hartford. The city has a stalled minor league baseball park project plus a failed effort to bring in professional soccer. But it appears to have reversed course with a pair of different eyesores - two badly managed public golf operations. Leaders say their $11 million renovation is a success. From Hartford's perspective, the Keney and Goodwin golf course renovations could not have gone better. Still, documents the NBC Connecticut Troubleshooters obtained indicate the number of golfers using the courses will have to rise dramatically for the city to break even. Still, golfers were impressed by the improvements. "I think it was very nice, the greens were exceptional. Much different than they used to be," golfer George Stearns, of Watertown, said. Dial back two years and fairways were embarrassingly bare, the rough overgrown. Hartford fired the company managing the courses, then secured $11 million to shore up Goodwin, a course in the city's south end, with the lion's share of the money going to Keney in the north end, for an extreme makeover. “It was unplayable,” Hartford Superintendent of Public Works Tom Baptist said. “There were tree saplings growing out of sand traps, the greens were not puttable, they were all burned, completely lost, the irrigation system had failed and not been repaired. The clubhouse itself had been closed by the city health department as not habitable, because of mold and other problems, so we really inherited a wrecked golf course." The city brought in the Connecticut PGA to consult on running the courses better, plus a top notch superintendent and maintenance team. A well-known golf magazine even gave Keney “Renovation of the Year” honors. “You can see that they've cleared out an awful lot here and done a wonderful job," golfer Bob Latham of Wethersfield said. The city wants Keney and Goodwin to break even produce a small profit. Hartford expects Goodwin will reach that goal next year, with Keney in the black the following season. 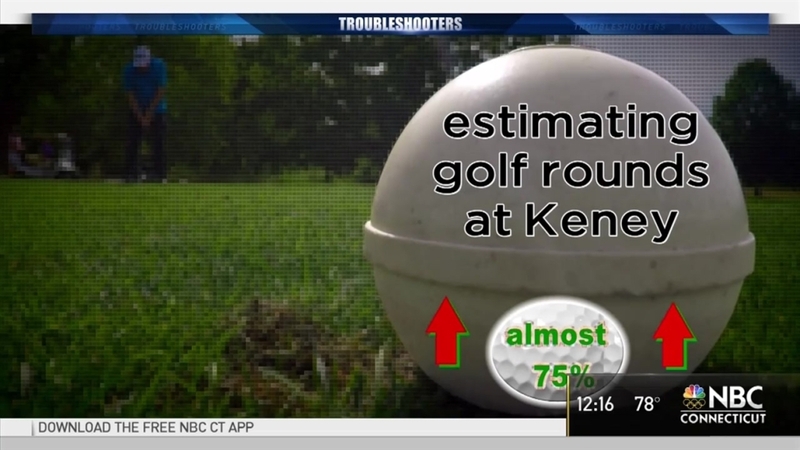 However, city projections obtained by the NBC Connecticut Troubleshooters indicate this is based upon Hartford estimating golf rounds played at Keney will increase almost 75 percent between now and 2019, with Goodwin up more than 25 percent. The National Golf Foundation says overall in the USA, rounds played have gone up only in the low single digits the past 18 months, after sizeable declines for years. Baptist explained. "We're very confident we're going to meet those levels. Our projections are conservative to start with. We have some idea of the kind of golf, in terms of the number of rounds, that had been played here in the city in the past." Swing over to other large Connecticut cities, where New Haven and Waterbury each have well maintained courses. New Haven has a private company manage its course, and it often makes a small profit. "It's definitely not free," he said "But it comes at a great, low price, for residents, who get a break on it, as opposed to non-residents." But is spending tax dollars on golf something Connecticut towns and cities should venture into at all? Quinnipiac University economist Donn Johnson said while it makes for a cheaper round of golf, he wonders by how much, and if this really brings new players in, or just takes them away from clubs that do not get government help. "You ask yourself a basic question then, if they're not making money, and the other benefits are not that clear cut, why are they in the business of subsidizing golfers? At that point, why aren't you subsidizing almost any sort of activity? For some reason they've chosen golf. It has been a common thing historically, but it's not an obvious thing to me as an economist why they would be doing that," he said. In the case of Hartford, more work needs to be done, even still. The city tells NBC Connecticut Troubleshooters the Goodwin golf course really could use a new irrigation system that will cost about $2 million Hartford does not have right now. One way to get that money could be higher greens fees but then the city risks losing the golfers it just brought back.